I am a working mother, wife, and an all around domestic goddess. Ok, that last title is normally reserved for the weekend routine, but hey, I like the way it sounds, and quite frankly, I rock that title! Being the only cook in the family, I am the one to come up with dinner ideas, making sure they are gluten-free and that my family, who are just a tad stuck in their dinner ways, will actually consume what is made. I popped into the grocery store last night after work. Ok, so I drove there and walked in, but “popped” sounds so much cuter, not to mention fun. I wasn’t planning on spending much, and only went a tad over what I anticipated (go me!). My daughter was with me, and as we were walking up and down the aisles, she said, “hey Mom…how about breakfast for dinner”. Seeing as I would be starting dinner around 6:00 p.m., I thought that was a great idea. So we had eggs, hashbrowns, bacon and toast. Easy-peasy and I could crash early, seeing how I started my day at 3:00 a.m.
Thursday: Baked chicken wings; half will be coated in wing sauce. Served with rice. Friday: Grilled Tri-Tip and Scalloped Potatoes and corn on the cob. Now all of these meals are homemade. I don’t buy premade dishes, for the most part, esp. not at dinner. As we will be home before 5 on Friday, I saved the longest prep dish for that day. The homemade scalloped potatoes take a couple hours to prep and cook, but are so worth it. It’s also nice to know how to plan different aspects my week, knowing how long dinner will take to make and clean up. I am so pleased with myself, I need to make this a habit instead of a just picking a few meals for the week and winging the rest of the dinners we will need. The weather has been absolutely gorgeous today. We hit 71 degrees this afternoon. It’s still really nice out, so I thought I’d start the BBQ up and we’d have some bbq chicken and baked potatoes. 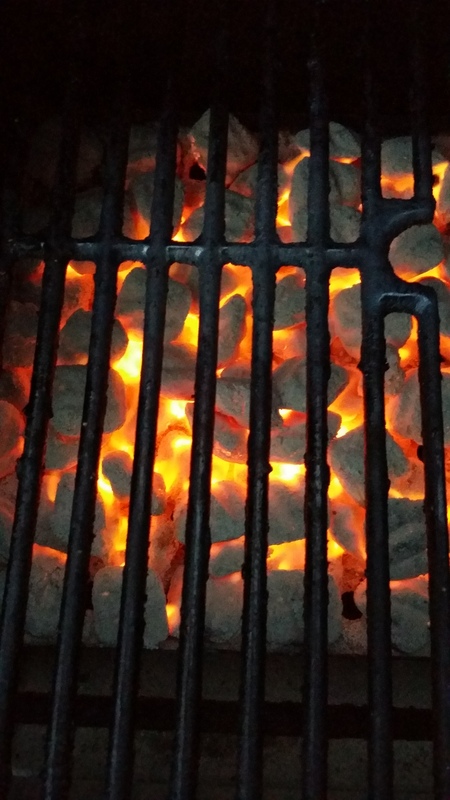 I really enjoy grilling and it’s so easy, minimal cleanup and there’s no risk of my over-sensitive smoke detectors being activated. Seriously, I don’t know who set the settings, but any amount of “heat” will set them off. Not only do they have an annoying alert, but they also have added, “Warning! Fire! Fire! Oh I despise those settings. The chicken is almost done. That’s where I’ve been. Cooking and making sure the skin is just right before moving it indirect heat to finish cooking. Grilling outside tells me Spring is on the way. That’s a half-truth. If it’s not really windy or too cold, I’ll crank up the bbq just because I can.